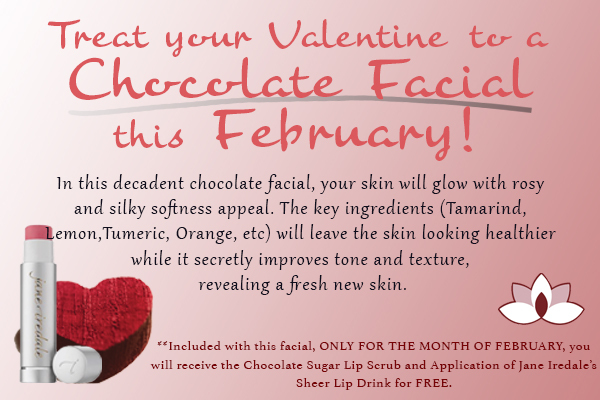 What better way to celebrate Valentine’s Day, Week, or Month with a Chocolate Facial from our own Licensed Esthetician, Victoria Kniess. Let the chocolate invigorate your skin while the Lemon, Tumeric, Orange and other amazing healthy ingredients secretly improve the tone and texture of your skin. We can make this facial a couples facial if you would like to bring your significant other in for Valentines Day. This service includes an Exfoliating Cleanse, Chocolate Mask, Massage, Treatment Oil and Moisturizer. You will also get to try our Chocolate Sugar Lip Scrub and have an application of our Featured Product of the Month, Jane Iredale’s Lip Drink, to keep your lips smooth and protected from the harsh winter winds. Also make sure to grab your Lip Drink (10% off) at the Reception Desk to maintain the wonderful silky smoothness that this product helps to preserve.